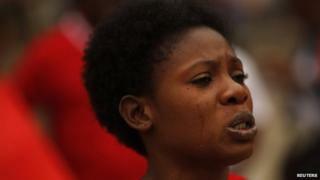 Nigeria abductions: Will publicity hinder negotiations? While the Nigerian government says it is ready to hold talks with the Islamist group Boko Haram, the chances are that intermediaries are already involved in behind-the-scenes efforts to secure the release of the more than 200 school girls being held captive by the militants. They could be moderate Muslim clerics, human rights activists or local elders, but their task is probably far more difficult because of the media glare on Nigeria - a point ex-US Navy Seal Dan O'Shea makes. "Hostage releases were done in Iraq. They were done in secrecy. They were done in back-door channels," Mr O'Shea told BBC Newsday. "This case has brought such worldwide attention that it takes that option off the table for the Nigerian government." Boko Haram has a propaganda arm, known as the "public enlightenment department". It is not as sophisticated as that of militant groups such as Somalia's al-Shabab which runs a radio station and has propagandists with a good command of English. It also had several Twitter accounts until recently. Instead, Boko Haram hand delivers videos to journalists in the northern Nigerian city of Maiduguri, the group's former headquarters, containing messages from its leader, Abubakar Shekau, in the local Hausa language and Arabic. The videos are given to local newspapers and one foreign news agency - French-owned AFP, which obtained the video showing 136 of the abducted girls on 12 May. "The media focus makes it more challenging," says Mr O'Shea, pointing out that it gives Boko Haram the opportunity to gain maximum publicity and "leverage" over the Nigerian government. Some analysts believe the intervention of countries such as the US, UK and Israel - which have sent experts to Nigeria to help deal with crisis - will also complicate efforts to gain the freedom of the girls. Boko Haram has a deep-seated hatred for these countries, and it is bound to toughen its position in the hope of humiliating the Western powers to enhance its status in the eyes of the global jihadi movement. The abduction of the girls has, after all, put Boko Haram in the big league of African jihadi movements - alongside al-Shabab, which was responsible for the siege of the Westgate shopping mall in Kenya in September 2013, and Mokhtar Belmokhtar's Signed in Blood Battalion, which seized control of a gas plant in Algeria in January 2013, with about 800 workers in it. Both these sieges ended in a bloodbath - in Kenya, at least 67 people died while in Algeria, where the security forces stormed the gas plant after refusing to accept foreign help, about 80 people were killed in the ensuing shoot-out. In Nigeria, more than 200 children are being held in the vast Sambisa forest - the main hide-out of Boko Haram, along the border with Cameroon. Grant Fredericks, a forensic video analyst who teaches video science at the FBI's national academy, says experts will study the the video carefully. "The investigators will look at the kind of vegetation in the area that will narrow to a degree some of the potential locations. They will also look at shadows and try to determine, if they can, where and when it was recorded," Mr Fredericks told the BBC's Today programme. He says the US once did this effectively with the late al-Qaeda leader Osama bin Laden, using an "iconic" video of his to establish his location while he was on the run after the overthrow of the Taleban in Afghanistan in 2001. In Nigeria, locals already have clues to the whereabouts of the children and their captors. Hunters - with expert knowledge of the area - tried to enter the forest soon after the 14 April abductions to track down the girls, but turned back after villagers warned them that the Boko Haram base was well-protected and they risked death. Mr O'Shea says there are bound to be casualties if the security forces launch a rescue mission. "Many of the young girls could be caught up in the crossfire. There are very few options for everyone involved - the Nigerian government [and] the Western governments that are sending law enforcement, military and intelligence capabilities to help with the search for these girls," he told the BBC. Boko Haram and the government have quietly negotiated prisoner swaps in the past - including that of Mr Shekau's wife in exchange for the release of the wives and children of government soldiers. And last year, Reuters news agency reported that the Nigerian government paid a ransom of more than $3m (£2m) for the release of a French family of seven, including four children, abducted by Boko Haram in neighbouring Cameroon. So if intermediaries are involved in efforts to free the girls, money is bound to change hands - and that would help strengthen Boko Haram's war chest. "How this ends no-one knows but there just isn't a lot of good endings to this story," says Mr O'Shea. "No matter what path you go down - be it negotiations or the attempt to launch a hostage rescue mission that will be fraught with danger."